Rescue procedures can be modified to help give you the working space needed to carry out a successful operation. This is a solution to a situation where there is very little working space between the edge of the crevasse and the person who is in self-arrest posi tion to hold the fall. Normally, the anchor and then the Z-pulley would be set up in this space. But now there's not enough room. The answer is simply to set up the main anchor behind the climber in self-arrest (instead of between the climber and the crevasse). Attach the climbing rope to the main anchor with a friction knot or ascender—but at this point, leave a couple of feet of slack between the main anchor and the climber in self-arrest, so that this climber isn't trapped in the system by tension on the rope. This is where a temporary anchor comes in. Between the climber and the crevasse, set up a temporary anchor and use a prusik sling to secure the rope to it. This permits the climber to ease off from the self-arrest position, let the temporary anchor take over the weight, and untie from the climbing rope. Now the rescuers can set up a normal Z-pulley in front of the main anchor. They now have plenty of working space. Once hauling begins, the prusik attached to the temporary anchor can be untied. Rescuers trying to work in a very narrow area between two crevasses can consider moving the operation. The rescue might proceed better if it is run from the opposite side of either crevasse. Another option in a tight spot is to change the direction of pull on a Z-pulley system. Hook another pulley to the anchor and run the hauling end of the rope through it. Now the rescuers can pull in a direction more parallel to the crevasses. Rescues from the uphill side of a crevasse are harder than those from the downhill side. 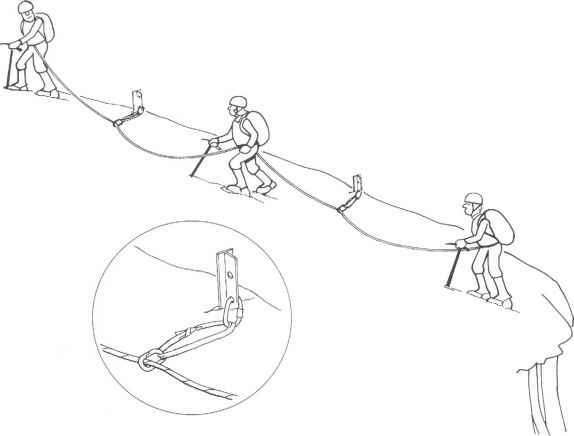 If possible, move the operation to the lower side, where it will be easier for rescuers to haul and for the fallen climber to get over the lip of the crevasse.